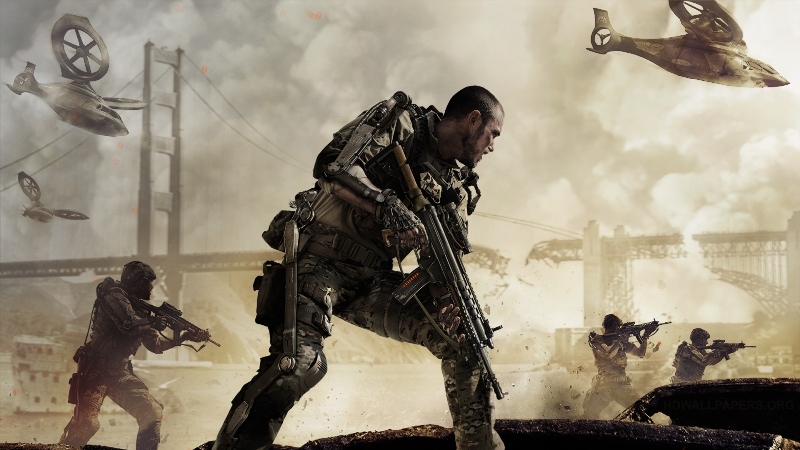 Is Advanced Warfare the best Call of Duty ever? Call of Duty: Advanced Warfare is released tomorrow (or today, if you pre-ordered the game…) and anticipation is high. We’ll be posting a full round-up of the reviews tomorrow, but in the meantime, here are a few reasons Advanced Warfare may be the best entry in the series yet. If you fancy getting your hands on a brand new PlayStation 4 and a copy of Advanced Warfare, check out our competition. You’ve got until tomorrow to enter! Advanced Warfare is the first Call of Duty game to be made by Sledgehammer Games, although they did previously assist with Modern Warfare 3. There are 2 good reasons to be excited about this. The first, obviously, is that Sledgehammer will bring a fresh approach to franchise (more on that in a bit) after years of rotation between Infinity Ward and Treyarch. Sledgehammer was started by some of the lead creatives behind Dead Space, so they have a decent track record too. Secondly, it means that the Call of Duty franchise now follows a three year development cycle; each game will now be the result of three years of work rather than two, which should lead to bigger, better and more polished games. There hasn’t been a truly great Call of Duty campaign since Black Ops, with the mode seemingly neglected in favour of the more-popular multiplayer mode (after all, many players don’t even bother with the campaign). Fortunately, Sledgehammer seems to have taken note and have produced the best campaign since Modern Warfare (according to an early review from Eurogamer, at least). The campaign takes place in the mid-21st century, which gives Advanced Warfare an almost sci-fi feel, with a global corporation (helmed by an extremely realistic Kevin Spacey) threatening the world with various technological terrors. This provides Sledgehammer with the opportunity to break free of the standard Call of Duty mission formula. While you’ll still be laying waste to more or less anything that stands before you, you’ll also be piloting drones and using your fancy exosuit to do some futuristic sneaking about. Advanced Warfare’s future setting has allowed Sledgehammer to introduce a series of gadgets that seriously shake up the Call of Duty formula. The main new addition is the Exosuit, a suit of armour that allows you to boost, double-jump, climb walls and various other cool stuff. While you can only use certain features at certain points, it’ll certainly make a change from the standard Call of Duty sprint/take cover/shoot formula. The game also introduces drones (including one that looks a bit like the giant snake-nasty from Avengers Assemble) and explosive computers, which is certainly different. Call of Duty is the most popular multiplayer game in the world, so changing the formula entirely would be ridiculous. However, after last year’s Ghosts, it was pretty clear that it needed freshening up. Luckily, Sledgehammer appears to have done just that. They’ve introduced some new game modes, the pick of which is Uplink, which is like Capture The Flag with a high-tech ball. Instead of planting the ball at a set location, however, you can either throw it through the ‘Uplink’ hoop or ‘slam dunk’ them for 2 points. Pick 10, the popular perks system from Black Ops II that was sadly removed from Ghosts, also makes a return, although it’s been expanded to Pick 13. Perhaps the best innovation, though, is the introduction of a firing range. Instead of blindly going into a match with a new gun, you can try it out in the pre-game lobby and see if it suits your play style. Remember: our Call of Duty competition closes tomorrow, so enter now!